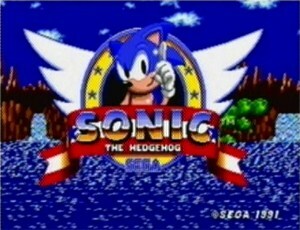 Sonic the Hedgehog was originally released on the Sega Genesis on June 23, 1991. The game has seen several re-released versions, and one of those versions was for the Nintendo Wii's Virtual Console. Sonic the Hedgehog was re-released for the Virtual Console service on November 19, 2006 at a price point of just 800 Wii Points, which is $8. The game received an ESRB rating of "Everyone" with no content descriptors listed for parents/gamers to be aware of. With Sonic having just had his 20th birthday this last week, how many hours Wii owners have reported playing Sonic the Hedgehog with over 4 years of game-play reported? Let's take a look! are not for all Wii owners that have downloaded and played the game. 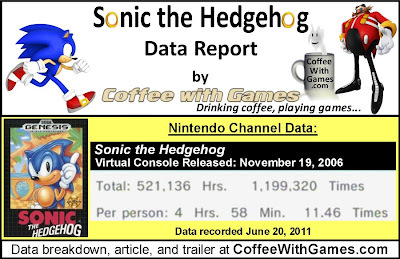 Sonic the Hedgehog on the Virtual Console has had about 104,652 Wii owners report play-time data through the Nintendo Channel with 1,675 days of data reported. How many more players has Sonic the Hedgehog seen increased reporting data since the report last October? 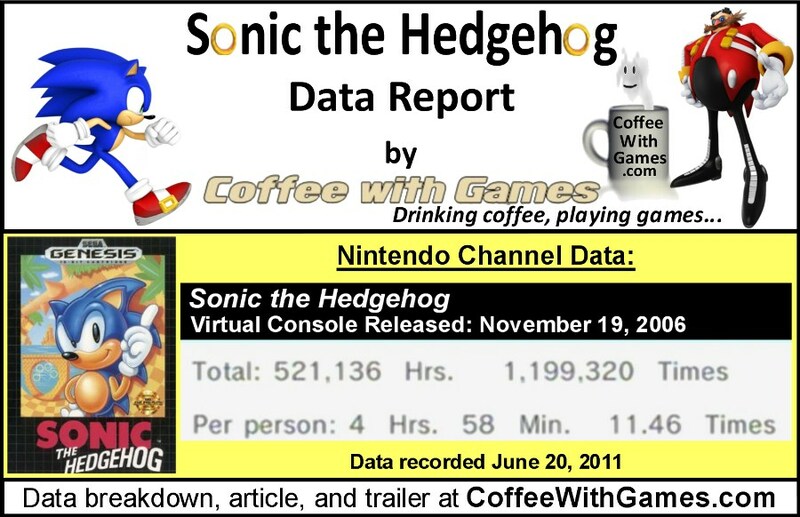 Sonic the Hedgehog has seen an increase of about 8,929 more players having reported data since the data recorded from October 4, 2010. Sonic the Hedgehog has 521,136 Total Hours of game-play reported, which is an increase of 74,211 Total Hours since last October. The game's average play-time "Per person" is now 4 Hours 58 Minutes, which is an 18 Minute increase over the average recorded on October 4, 2010. Sonic the Hedgehog's average play-time per session is just over 26 minutes. Sonic the Hedgehog is not currently listed in the Virtual Console's "Popular Titles" section, which lists the current "Top 20" most downloaded Virtual Console titles. Sonic the Hedgehog's American Virtual Console version has made Sega about $837,216, before taxes and profit sharing with Nintendo, based on the approximate number of players that have reported game-play data and the game's $8 price point. It has made about $71,432 more, just since October 4 last year. Menu image captured from the game. Sonic the Hedgehog's "professional" review score average is 90.17%, based on 6 reviews on GameRankings.com. If any of you didn't know this last week was Sonic's 20th birthday, it's okay, because he didn't know it either(being he isn't real!). I do think it's interesting that while Sonic started as a Sega console exclusive, and a competitor to Nintendo's Mario, he now has found a home on all current generation consoles, and most mobile platforms in recent years. I personally would pick Sonic Adventure on the Dreamcast as my favorite Sonic game, as it was the first game I purchased with my Sega Dreamcast system, and I spent many hours playing it. Did any of you find yourselves playing a Sonic game, perhaps Sonic the Hedgehog, this last week to celebrate Sonic's 20th birthday? If you consider yourself a Sonic fan, what do you think is his best game released in the last 20 years? I didn't play any Sonic games this on the 23rd but I will say that Sonic 2 would be my favorite out of all the Sonic games I played. Sonic and the Dark Knight would be my second. Haven't played Colors yet. It's funny - but this freaking video game character actually had me feeling kind of old last week. I still remember when it released. My son and I did in fact fire up our genesis and play a couple of the Sonic games (1 & 2). He and his little sister grew up on all things Sonic. Loved the 3D games I hated, watched the cartoon, had Sonic and Knuckles stuffed animals... too funny really. That said, the first Sonic while not technically the 'best' - was still my favorite. That, Columns, an EA Golf game and Altered Beast were the first 4 Sega Genesis games I got to play when my uncle gave me his Genesis, and Sonic was way ahead of those titles and was my favorite on the Genesis for awhile. The only sonic game I played properly was sonic the hedgehog on my game gear back then. I nearly beat it too, but the infamous power plug issue reset the game just then. Don't think I've ever gotten that far again afterwards. Other than that I just got to try sonic rush on the DS a bit and Colors on the Wii, but not really a fan of the speed gameplay. Since the original felt a lot slower and more platformy I think. Somehow I totally missed out on the anniversary this week. I'll have to locate a copy to celebrate. We only had resources for Nintendo in my house, growing up. But, a few of my friends had a few of the games for Genesis, and we spent countless hours playing the first two. I would have to say Sonic 2 was my favorite, followed closely by the first title. The graphics and fun factor were genuine for its time. Never really got into the Sonic 3 or any others for that matter. I've been meaning to play some of the more recent titles. Has anyone here played Sonic 4? I'm curious about that one. "Sonic and the Dark Knight..."
I don't remember reading much on this game, but I thought that a lot of the "fans" seemed to not like it...do you know if that was the case with this game? "My son and I did in fact fire up our genesis and play a couple of the Sonic games (1 & 2)." Nice! I almost played Sonic Adventures...but the whole "time management" thing seems to be an issue these days! It's cool that you fired up the Genesis though and got some play-time with the first two Sonic games. "The only sonic game I played properly was sonic the hedgehog on my game gear back then." So did I! My brother had a Sega Game Gear, and I remember playing Sonic on it, and also Shinobi and a tennis game. Were the Adventure series games only on the Dreamcast, or did they make it to other consoles also? "Has anyone here played Sonic 4? I'm curious about that one." @Coffee I think most gamers issue with the game was that you had to stop and fight the enemies. You really didn't have to fight anything other then the bosses.I usually just speed through the level and if I wanted to fight the enemies and defeat them quickly I would. If I didn't I would just jump over the enemies. Also most reviews compared Sonic and the Black Knight to Sonic Unleased since that was the most recent game before Black Knight.However The Black Knight is part of the Storybook series so it should have been compared to Secret Rings.Most reviews I saw had Unleased higher then Black Knight but most gamers consider Black Knight the better game. So I don't get the logic there. very good and cool,thank you for your sharing.a blue hedgehog.I love it.